What to expect during a new installation. A Skylight Installation Happens In Two Phases—Rooftop and Interior. Depending on the circumstances such as the number of skylights, roof pitch, interior light shaft depth/shape and weather, installations can take between a half day and three days. 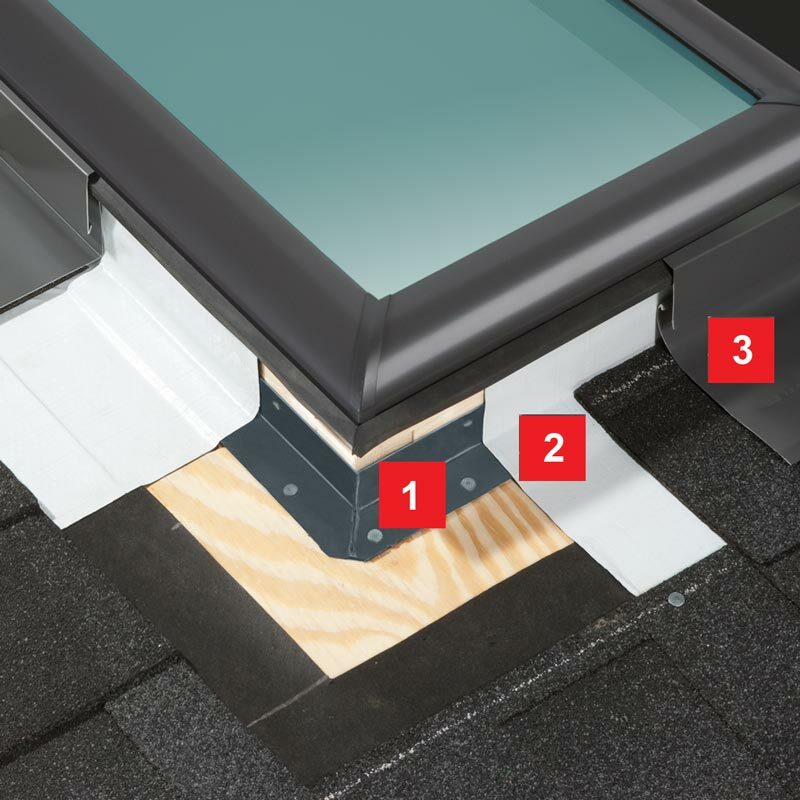 After the layout has been completed, the rooftop portion of the installation includes cutting the hole and fastening the skylight to the roof with the three layers of protection found in VELUX No Leak Skylights. 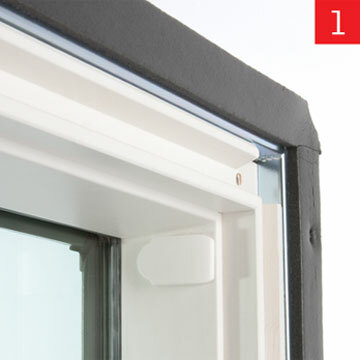 Provides a seal between the frame and roof deck. 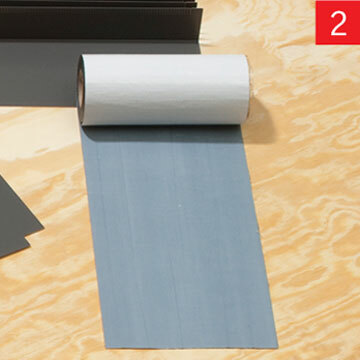 Adhesive underlayment protects against ice and wind. Engineered flashing for primary water protection. 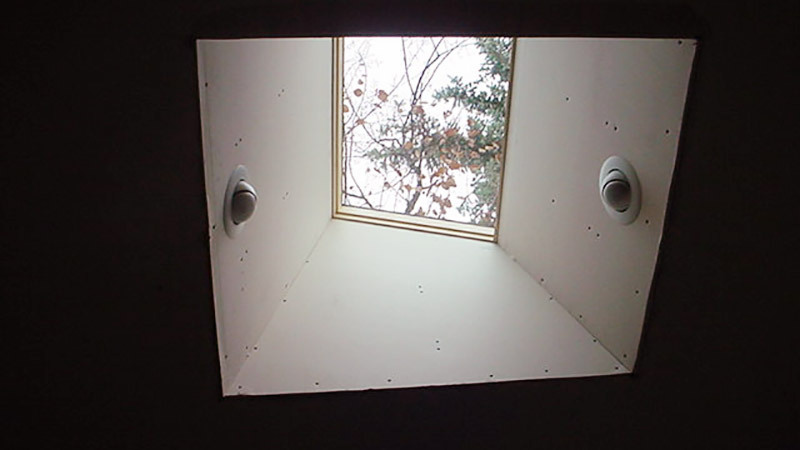 It takes about a half day per skylight to complete the interior portion of the installation, which includes drywall. The type of ceiling in your home—vaulted or flat—will also affect the amount of time it takes to complete the interior portion of the installation. Flat ceilings require more drywall work than vaulted ceilings. 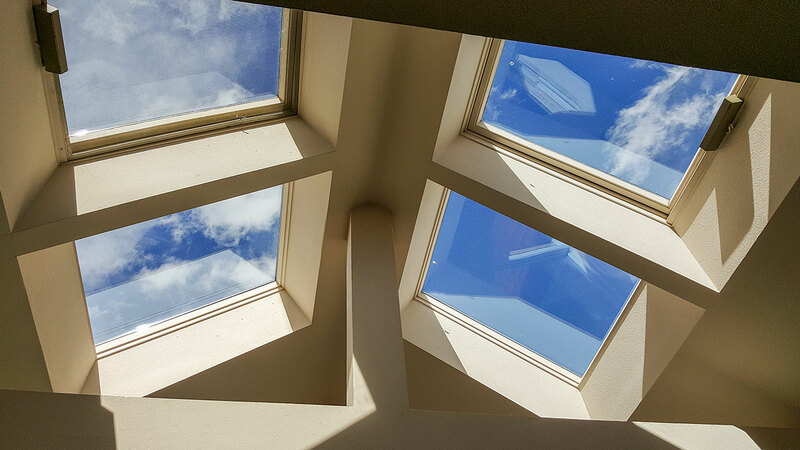 If you have a flat ceiling, your skylight specialist will use framing and drywall to build a shaft from the skylight to direct the daylight into the room. Flat ceiling skylight shaft under construction. Our skylight specialists will make every effort to protect your home’s interior from dust and other installation debris. Often they will construct a curtain of plastic sheeting around the space in your ceiling where the skylight will be installed to contain dust. When installed with VELUX flashing kits, skylights and the installation carry a 10-year No-Leak Warranty. 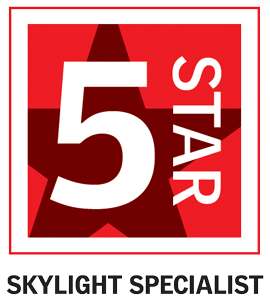 Skylight Specialists, Inc. warrants our work for five years. 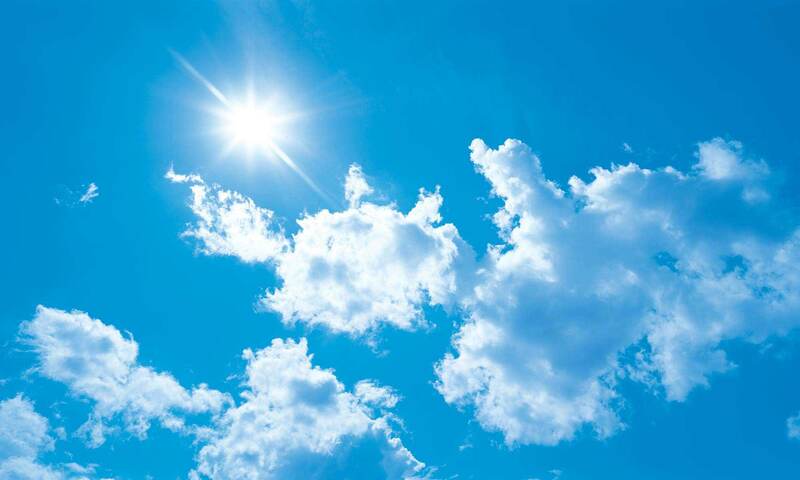 Your skylight specialist is the best person to evaluate your home’s daylighting needs. They can recommend where skylights should be installed, so you can reap maximum benefit from the natural light and fresh air they provide. 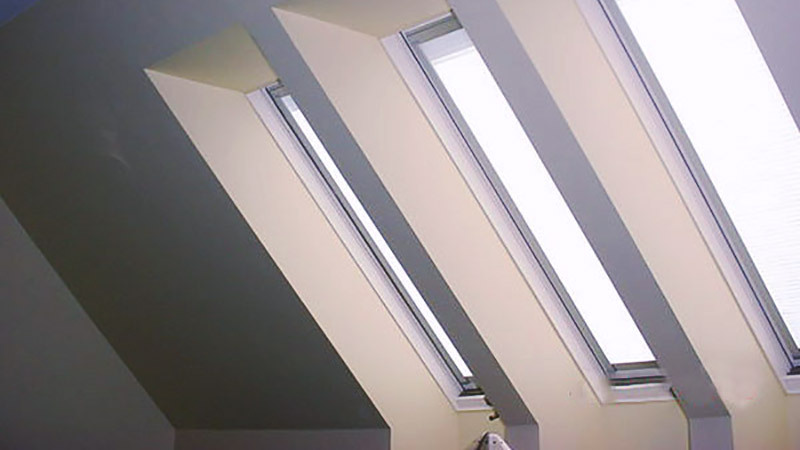 Skylights can be installed in flat or vaulted ceilings. For vaulted ceilings, your specialist will not need to build a light shaft, but will complete a small amount of interior drywall work in your ceiling. 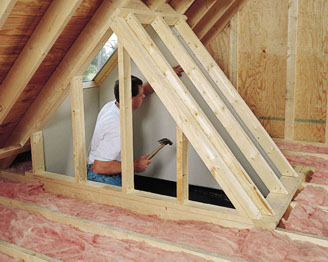 For flat ceilings, your skylight specialist will build a shaft or light well using drywall to connect your skylight from the roof through the attic space to the room below. Shafts can take a variety of shapes and sizes, which will affect the way daylight is delivered to the room. 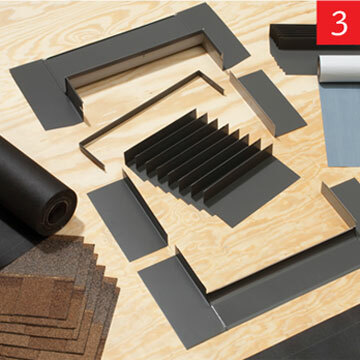 Before your skylight specialists get to work, they will have determined the best location for skylights in your home. Orientation on your roof will affect how much light comes through your skylight and the role it will play in improving your home’s energy efficiency. Homes in both climates can reduce cooling costs by utilizing natural ventilation — the chimney effect — to draw cool air in through open vertical windows and expel hot air out through open skylights during the cooler times of day. Once your skylight is installed, rest assured that VELUX skylights are backed by a 10-year warranty on product and installation. So, sit back, relax and enjoy the view.